I am in love with this dress and am getting married in July 2014. I would love to fake it - but I don't know where to begin. Do you have any suggestions? I found this dress but it's not quite the same in terms of the loose cut and fabric, so I wanted to investigate my cheaper options. Thanks for this blog - it's definitely a resource for this Brooklyn Bride - to - be! Please don't try to fake Givenchy. Buy something original + cool. And under no circumstances should you have your talented designer/seamstress friend ( or cool local designer with cute store) try and make you a replica. This dress has the ombre effect and I think she accepts custom jobs, if you want a different neckline/etc. that's the one she found. but yes, agreed, probably the way to go if she really is going for a replica. you can't get something cheap. that kind of tailoring doesn't happen in mass-market chinese-made stuff. This Helmut Lang is a bit different, but gorgeous. Dianne von Furstenberg has another ombre gown. Otherwise, I would definitely go with the Wai Ching. I choose the DVF, hands down. Also, do not DIY this. There are a ton of instructions on the internet, but it would be so so sad if you got it wrong on your wedding dress. Am I the only one who sees bloody tampon when I look at these? Bloody. Tampon. I was eating my oatmeal. That's all your guests will see = tampon. Or a dress that was accessory to a murder. Pick a different color for dip dye. Please feel free to jump down my throat for what may be a dumb suggestion, but can't one buy a gown and then have it ombre dyed? Sure, you should be able to find places for getting stuff dyed (all risks of them doing a half-bad job included). 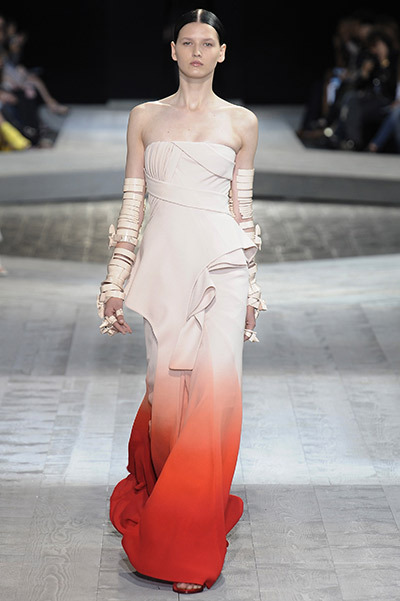 But the real difficulty is in finding a gown already structured like the couture number pictured above, no? Hard stuff to find. Agreed. Searched around for ten minutes and got nothing. Kind of similar? But it's expensive enough that I would REALLY hesitate to dye it. And this is coming from someone who has hand-dyed before. Also, the only fabrics that take dye really predictably and easily are 100% cotton or 100% silk. I also see bloody tampon. Rob you were all "YAY" when the Wai Ching came around the first time, haha. What's changed? I guess I've finally come to my senses. Does anybody do ombre the other way around? Seems like it would be a lot more flattering to have some color near one's face. Or maybe it doesn't matter because a real woman wouldn't look like the corpse-like model in this pic? It doesn't have to be OMBRE, people. Just find her a damn dress. I love the Free People and DVF dresses. Wondering if the FP one will be a bit too casual for a wedding... Great suggestions, thanks! you could look in your area for dress designers (not wedding designers but dress designers/makers), maybe there is an art/fashion school near you. check out some portfolios and see who has the aesthetic you are looking for and see what they can do? sorry if you were hoping for it, but there isn't an easy replica for this one, you may need to look more out of the bridal box since it's not a typical gown. rent the runway? Is it the shape or the ombre you like? love. want. but also what is with the giraffe? and this one, not wedding-y at all but I love it, and the stupid smart ads in my browser won't let me forget it! How about Black Halo? Not dip dye but a similar edgy cut. The front is good but the back is eww. the back is like an 80s bridesmaid dress...Father of the Bride? interesting neckline and has a flowy bottom. I always think "Everybody was Wai Ching fighting... doodoo doodoo doodoo doot doot do"
I knew this dress reminded me of another. Thanks everyone! I am still on the hunt. I like the edginess of the dress plus the shocking color. I find a ton of these colored dresses to look a bit on the hippy-dippy side! OK, so this dress has been on my mind all week. Leanne Marshall of Project Runway fame? Reverse ombre, but not as edgy as your inspo. Another Leanne Marshall, but this one is iridescent.